One of the greatest things about boating is exploring new waterways. But there’s also something to be said for having good times with old friends, so why not combine the two? A childhood friend of mine, Chris Hall, joins me for this latest adventure. In our 20-plus years of friendship we’ve had a lot of fun together, but neither of us has ever been on Lake Nipissing. 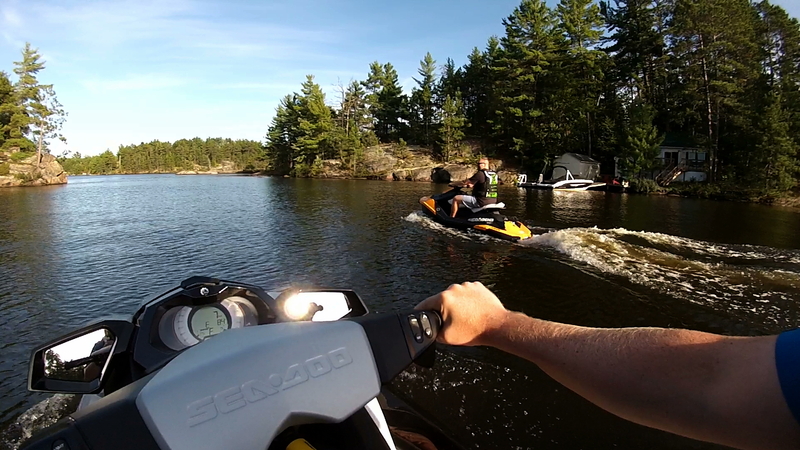 Before we can sort out our plans to explore one of the largest and most unique lakes in Ontario, we first have to get down to brass tacks and decide who will ride which Sea-Doo. We have two very different models to choose from – the Spark 3up and the GTI SE 155. Steve and Chris, the younger version, would have resorted to paper-rock-scissors or some flawed reasoning tactic to decide who gets first pick. But then again that wouldn’t help either, as both machines are appealing for different reasons: the smaller, lighter and fun-filled Spark would be a blast to whip around on the waves but the GTI would be a more comfortable and high-powered cruiser. 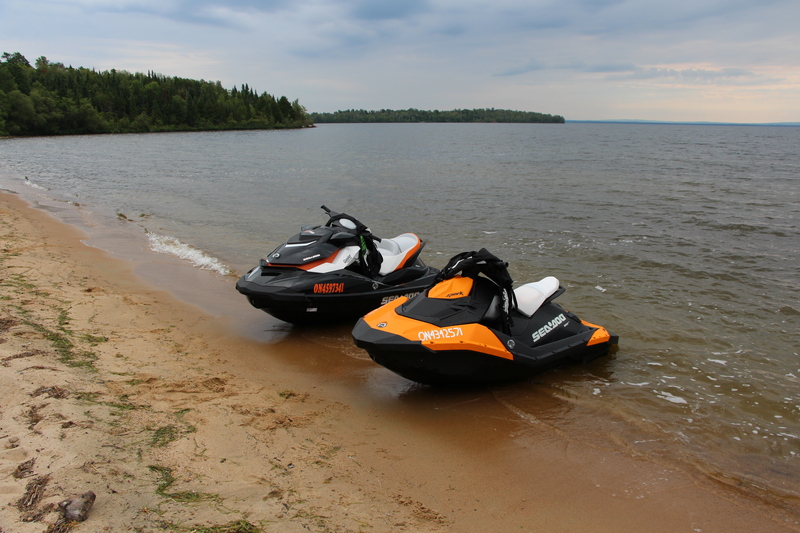 Partially motivated by a desire to try both Sea-Doos and partially because — contrary to what that 8th Grade teacher thought — Chris and I are capable of mature decisions and rational judgments, we decide we’ll each take one machine for one day and then swap. Our base for this adventure is West Bay Cottages in the Northwest Bay of Nipissing, about an hour’s drive west of North Bay, Ont. Because of its size, location and multiple access points, notably the French River, Lake Nipissing was an important part of the voyageur route used by Canada’s early European fur-traders. First Nations people had been using the route for millennia before that. Étienne Brûlé was the first French settler to “discover” the lake in the early 1600s. Visitors have been flocking here ever since. In 1986, because of its geography and importance as an early trade route, the French River — running from Lake Nipissing to Georgian Bay — was named a Canadian Heritage River. Brûlé is gone, but Bull has arrived, and we launch from the sandy beach at the small fishing resort owned by husband-and-wife team Randy and Lucille Paulin. The target for most is walleye (also known as pickerel) or muskie. But yellow perch, bass, and northern pike are common as well. 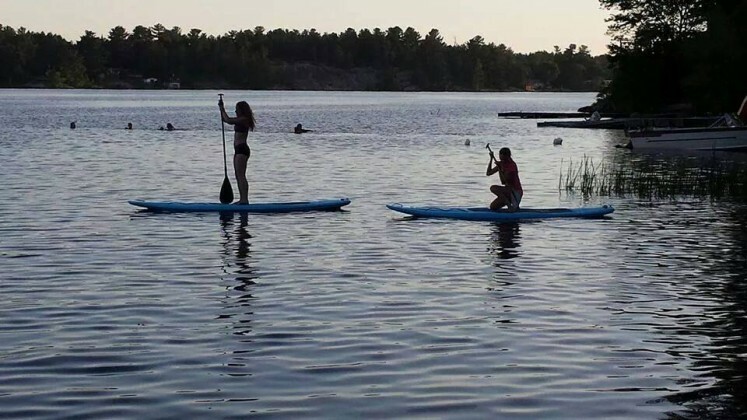 The stats are not precise — since there are multi-cabin commercial operations and single rental cabins — but it’s safe to say there are at least two dozen fishing lodges on the lake and many more cottage and guesthouse rentals. Just bring a rod, some bait and some patience, and you’re good to go. Randy says weekends attract boaters and families, while mid-week is primarily fishing groups. The cabins are small but comfortable. Anglers usually bring their own boats, but fishing boats and a pontoon boat are available to rent. But we’re not here to fish. And not to brag, but as it turns out, the idea that Chris and I had to explore the lake on personal watercraft is brilliant. When the Spark was launched, the Paulins also thought the back-to-basics PWC would be a realistic addition to their rental armada and, because of the low cost, would be a relatively low-risk investment. Right they were. Lake Nipissing is considered by many to be the gateway to Northern Ontario. Aside from the Great Lakes, it is the fourth largest lake in the province. It’s also unique because it is relatively shallow, with depths averaging just four-and-a half metres – or 15 feet. That means PWC are one of the best ways to explore it. Not to mention a ton of fun. About half of the lake’s surface is wide-open water and the rest more protected inlets and bays, like the area around West Bay Cottages. There aren’t many other boats on the water this time of year. Given good weather, the lake is positively idyllic. The total shoreline is around 683 miles (1,100 km) and there are lot of islands and bays to navigate. It’s beautiful but can be confusing, as most of the shoreline is just trees and rocky outcrops of the Canadian Shield. Canadian Hydrographic Service charts are helpful: chart 6035 covers the mainly open eastern portion of the lake; 6036 shows the French River in the lake’s southwestern reaches; and 6037 and 6038 cover West Bay and West Arm in the northwest. It’s also wise to have a GPS; and, always ask locals for advice. There are cottages (or camps, as northern Ontarians call them) around the lake, but the western shore has less development. On the eastern shore, the city of North Bay is sited along a wide-open section of the lake. Many homes and cottages there are stunning. The Nipissing First Nation is located half-way between West Bay and North Bay, near West Nipissing. With a population of about 65,000 including surrounding towns, North Bay is the business hub of the region. Employers include the local hospital, Nipissing University, Canadore College and CFB North Bay — home to 22 Wing of the Royal Canadian Air Force. Other towns around the lake include Sturgeon Falls, West Nipissing and Lavigne. 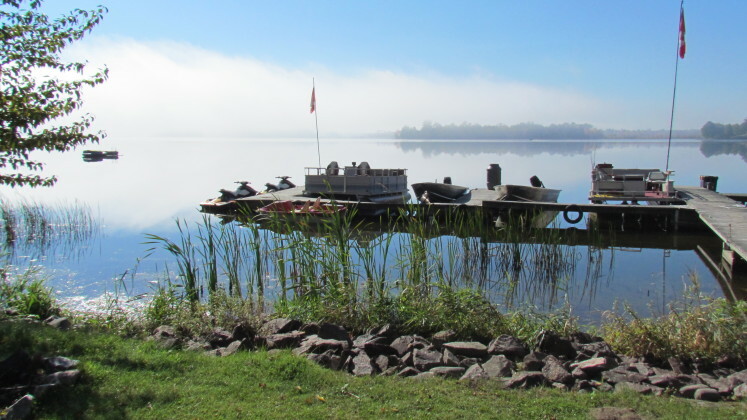 Because of the secluded nature of the western swath of the lake, it’s very popular for fishing trips. But on the first week of September we have just about every bay to ourselves. There’s no time to get too comfortable, we have a lot more lake to discover, so we squeeze the throttle and shoot out of the Northwest Bay, heading east and then south. Reaching a more open stretch of water we find the wind has definitely kicked up the chop. In our 30s, we’re still those kids who met on the schoolyard years ago, and we are on Sea-Doos, so we aren’t complaining. In fact, we aren’t doing much at this point but trying to out-do each other. Chris on the lighter Spark is able to flip the tail and slide it around hairpin corners and I, on the GTI, have the power to jump out of tight turns and up and over the larger waves. Calling it an even – but now wet – draw we get our bearings again and continue down to, and through, Hay Narrows into West Bay. It doesn’t take long at all to cover the approximately 19-mile (30-km) distance and, at the speeds we can safely and comfortably reach when we’re out of the chop, we’re dried off by the time we hit our lunch spot – Shuswap on Nipissing. Another fishing resort that’s popular for drive-up fishing junkies, it has a concrete ramp for boats. We tie up to the floating dock. Heading up the steps beside the manicured lawn to the restaurant we catch up with owner, Heinz Loewenberg. His wife, Gerda, is staffing the kitchen today. As we wait for our burgers — watched over by the mounted fish and game — Heinz gives us the back-story of how a First Nations name got from British Columbia to Ontario. In 1939 the area was sold and began its conversion to the new tourist-based camp. But the name stuck. “That traveller back in the ‘20s happened to be sitting with the local people inside the original lodge and that’s when he looked outward and looked upon the waters and said ‘Oh this reminds me of Shuswap.’ And the locals said, ‘What does that mean?’ and he explained it meant shimmering waters.” Heinz said there was no way he would change the name. Fueled up from our late lunch and eager for more exploration, we head back down to the floating dock. As we come around the trees Chris looks out over the bay as the sun moves lower in the sky. “Check out the water buddy,” he says with a chuckle. Shimmering. Right on cue. Well done, nature. The shimmering waters are, but for some ripples, flat and calm as we go ripping along the bay. The bay narrows and we switch into no-wake mode. It sure is scenic. We cross under the highway and continue along into Warren Bay, but it’s a long way back so we pull the ‘chute and leave the West Arm. In Warren Bay the concentration of waterfront homes is higher and I can see why; it’s a gorgeous spot. The rocks and trees look like something out of a Group of Seven painting and the cabins, cottages and homes look like a real estate dream come true. But this is as far as we can go without risking the daylight. So we do an about-face as we come to Mashkinonje Provincial Park and start working our way back east. The sun – though shimmering – is starting to sink fast. Passing back under the highway, we’re going to zip back along the same route we took to get there, but just in reverse. Once into the more open bay, it’s go-time. Another 19 miles (30 km) back and we’ll be home free, so it’s open throttle time yet again. We’ve covered a lot of ground – well, water – but tomorrow we get to see the other major facet of Lake Nipissing: the wide-open lake at North Bay and the islands that we’re told are home to a very cool beach. As dusk sets in, we round the point and head toward West Bay Cottages. Randy is on the docks and tells us a storm may roll in tonight; rain is forecast for tomorrow. It rains a little bit, and as the sun finally disappears we are treated to a very funky sky. 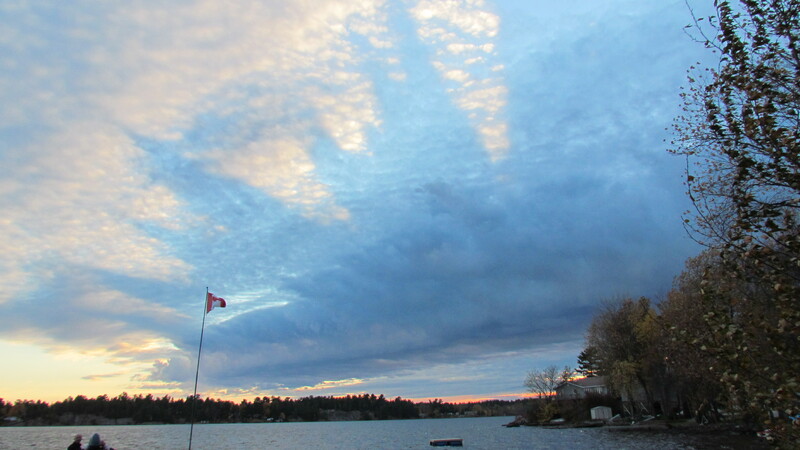 We settle into the cottage and hope the clouds will stay away come morning. We have to get out to that island beach we’ve heard of, after all. Priorities, you see. Come morning it isn’t raining, but not sunny either, so Chris and I make a quick executive decision. 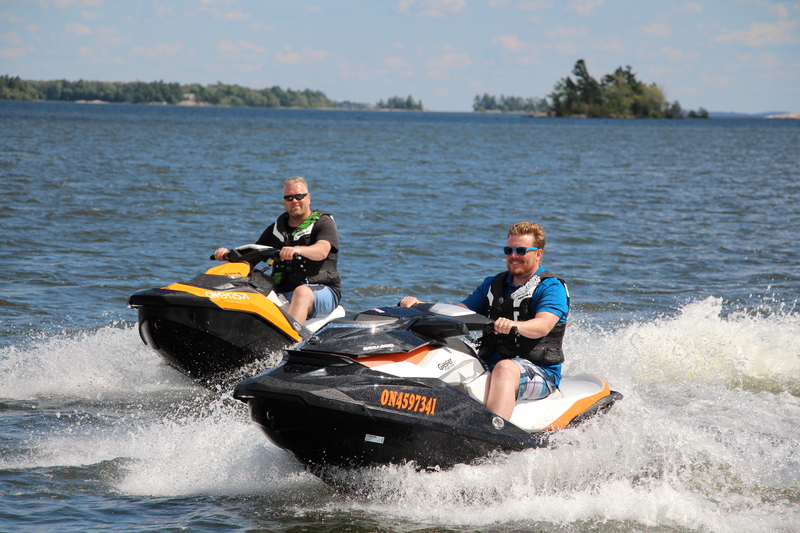 Instead of tackling the 25 miles (40 km) to North Bay on the water, we’re going to tow the Sea-Doos to the municipally owned North Bay marina and hope to catch better weather. The 270-slip marina has a great ramp and parking facilities and could easily be used as the base for a day’s adventure on the lake. Not far from the marina, the Chief Commanda II tour boat is moored. The original Chief Commanda ferry is now a waterfront restaurant known as The Boat and there are more bars and restaurants a short walk from the waterfront. If you want more than just a day trip, there are a handful of hotels near the marina. But we’re one-day wonders. As promised, we play nice like responsible adults and swap Sea-Doos for the day. But like overgrown children, we decide that we want to spend a little bit of time playing around in the open water again and feel the differences, and similarities, of these machines. After the protected waters of western Lake Nipissing, we find this section of the lake with its bigger waves too much fun to pass up. Still, we have a clear goal and a closing weather window. About five and a half miles (nine km) southwest is Manitou Islands Provincial Park – a popular spot, we’re told, for local boaters. With the size of the waves, we can’t go as fast as we’d like. On the larger and heavier GTI SE 155, Chris is able to cut through the waves and run faster than I can on the Spark, but we make good time, all things considered. Once inside the centre of the multi-island circle, things are much calmer. As we approach the sandy beach – the sun even teases us. Knowing there is a beach only accessible by the water, with PWC that are easy to beach, this was a must-do. It’s often a busy spot, but mid-week in early September we have the place to ourselves. That means one thing: an epic afternoon of Frisbee! 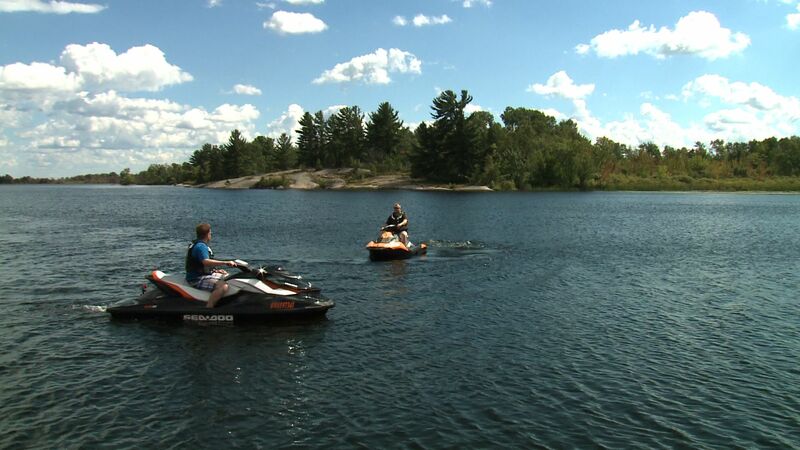 The islands are considered a “non-operating provincial park,” which means they are designated as a park but have no services or daily supervision. On Great Manitou the sandy beach – and Frisbee base – is a popular spot. It’s sheltered and fairly shallow, making it easy to play in the water. Day visits and picnics are encouraged but camping is not allowed. look for Blue Herons and osprey as they have colonies and nests nearby. If you do visit, look for Blue Herons and osprey as they have colonies and nests nearby. But don’t wander too far from the beach as poison ivy is common. We stick to the beach. It gives us a chance to joke around, like we used to, growing up near Lake Ontario and spending a lot of time on the beach and waterfront trails. It also gives us a chance to recap our Nipissing tour. 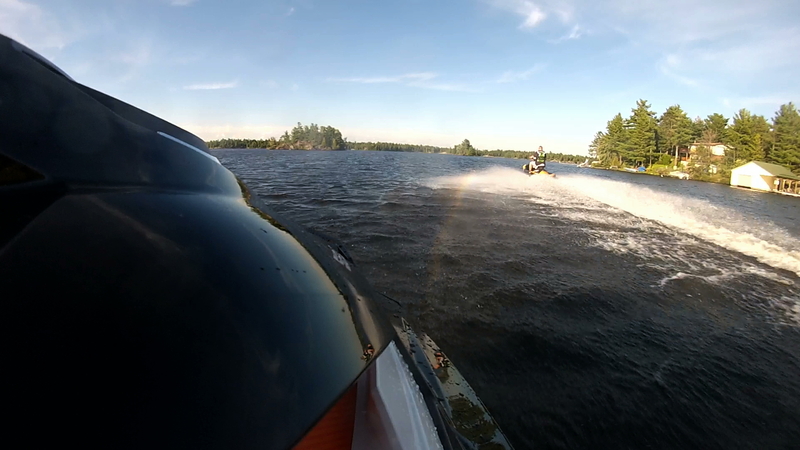 This is one of the joys of boating – well actually it’s the two that I mentioned off the top. 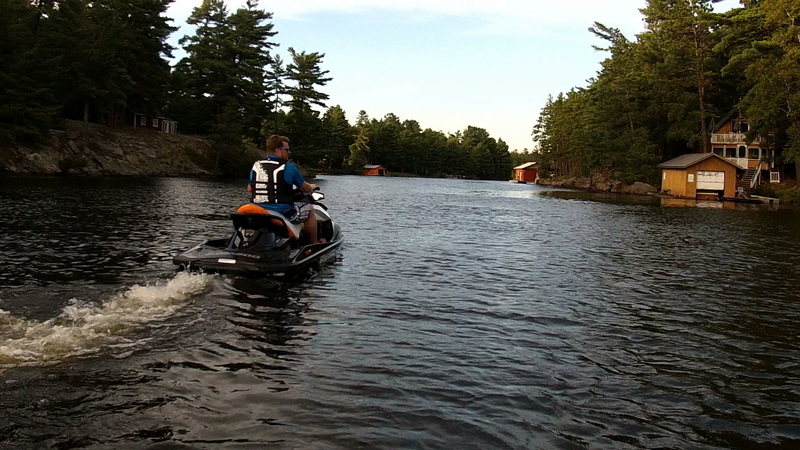 We get to try out new watercraft and spend a couple of days together, as old friends. It’s something that slips away as you get older. Though rarely accused of being full-fledged adults when we get together, our adult lives do get in the way of the adventures, that seemed easier to find as kids. A joy of boating is spending time outdoors with friends and family. With the Sea-Doos we are able to enjoy the water but also let lose and have the fun like we used to, far from the worry of bills and careers. But instead of dwelling on the moment and waiting for the Wonder Years narrator to kick in, we look to an increasingly overcast sky and see that Mother Nature is just about done cooperating. So we stow the Frisbee, fire up the engines and hit the throttle. But it is too late. The skies open up and we get soaked. The only time I let off the throttle at all was when I slow down to look behind and see if the dark clouds are closing in on us. They are. We get back to the marina and out of the water just in time. As we drive away from North Bay, a crack of thunder interrupts the cracking of jokes, something that only pauses briefly as we discuss when we can do something like this again next summer. 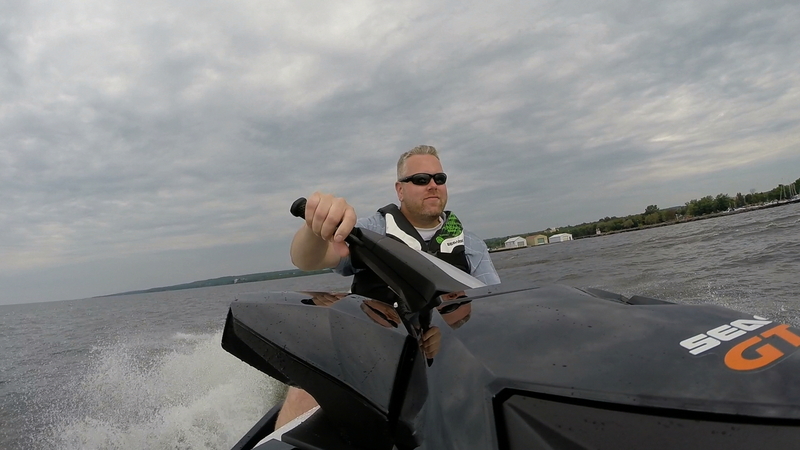 This destination is featured in the Winter 2015 issue of Boats&Places and in episode 7 of the 2015 Season of PowerBoat Television.